Dark, narrow streaks on Martian slopes such as these at Hale Crater are inferred to have been formed by seasonal flow of water on contemporary Mars. Detection of hydrated salts at the streaks supports that interpretation. The features are called “recurring slope lineae.” Credit: NASA. 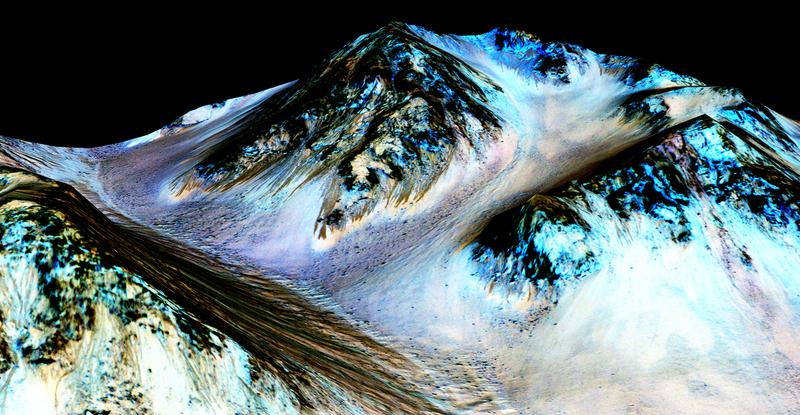 This entry was posted in Science News and tagged Mars, Mars Reconnaissance Orbiter, mission, MRO, NASA, orbiter, salt, spacecraft, water on 2015-10-02 by Heather Dalton.